CSIRO scientists have created ‘rogue waves’ more than 20 metres high and smashed them into virtual oil and gas production platforms to compare different mooring designs. The computer modelling project compares how different types of semi-submersible oil rigs withstand the effects of giant waves in the open ocean. Rogue waves are rare, extreme events that pose a risk to shipping and offshore structures and can lead to loss of life. They differ from tsunamis, which only grow large when they reach shallow water. CSIRO scientist and keen surfer, Dr Murray Rudman, said rogue waves were once considered folklore, but wave height monitoring data has blown that myth out of the water. “Rogue waves are huge waves that sometimes seem to come out of nowhere and, in recent years, they’ve been a major topic of scientific research,” Dr Rudman said. 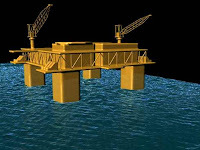 CSIRO is using fluid-flow mathematics and computer modelling to assist in the sensible and safe design of oil platforms. Modelling rogue waves’ effects enables researchers to conduct experiments – which would normally involve the use of huge water tanks – more cheaply, accurately and quickly. “Waves are extremely difficult to predict, especially when they begin to break,” Dr Rudman said. “Also, the movement of the wave and the oil platform influence each other in complex ways. “We use a mathematical technique called Smoothed Particle Hydrodynamics originally developed in astrophysics to model stars forming and galaxies exploding. Using the technique on a computer, the researchers can create a realistic rogue wave and pound the four legs and platform of the oil rig, which is floating on the ocean but tethered to the ocean floor by cables. Various cable mooring systems and materials can be compared. The computer measures the movement of the platform in many different directions over a particular time period to see how well the moorings hold. The results show the forces the wave impact generates on the structure and cables to see if anything breaks. Researchers can even see what happens when an oil rig capsizes. CSIRO is applying similar techniques to modelling dam breaks and landslides.